My students and I loveloveLOVED E-Mergency by Tom Lichtenheld and Ezra Fields-Meyer!! When I put the poster for Zero the Hero on the chalkboard, excitement was instantaneous. E-Mergency was a funny look at the way the letters of the alphabet work together (and how our words suffer when the E cannot be used). 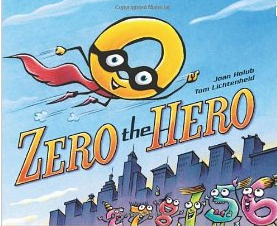 In Zero the Hero, ("A Book About Nothing"), Zero has all the trappings of a hero -- mask, cape, and pointy boots -- but he doesn't seem to be able to do anything amazing (mathematically speaking) all by himself. "The thought gave Zero a hollow feeling inside." So he runs rolls away. Without Zero, the other numbers realize they are severely limited. Then, when the Roman Numerals capture the Counting Numbers...well, Zero can finally be a true hero. This sounds fun! I really liked E-Mergency, but I wondered whether kids would get very much of the visual humor. So much of it seemed to depend on adult/past allusions. I love that Zero got a hollow feeling. I'm off to put this book on reserve!